One of my great passions in life is marine biology. Back home in Australia I’ve had the pleasure of living half my life in and around the water, whether it be sailing, snorkelling or helping conservation work. In a way, I feel connected to the ocean; seeing a large body of water makes me feel like I’m home, no matter how far away I am. Obviously, I was delighted to have the chance to go on the AIU tour to the Oga Peninsula. Armed with my phone camera, purse and a litre of lemon tea, I set out on the bus trip aiming to enjoy some of the beautiful sights the Japanese countryside has to offer. Let it be known that when it comes to natural beauty, Japan has yet to fail. Our first tourist-y stop was at the Gao Aquarium. As a noted fish enthusiast, you can probably imagine how delighted I was to be able to spend even a few hours at the aquarium, which was located in a picturesque space on the coast, ensconced amongst the natural rock formations that make up the majority of the Oga peninsula. So I don't waste thousands of words waxing poetry about fish, I'll summarise: The fish were beautiful, I had the chance to see some wonderful critters that I'd never seen outside of pictures, and I loved it. 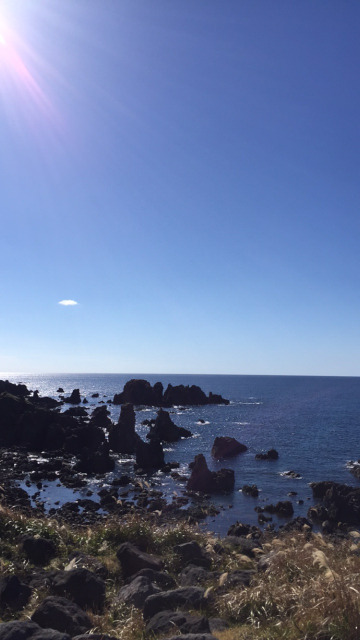 Our next stop was at Nyudozaki Cape, a stunning place overlooking the sea of Japan. As previously mentioned, theres nothing I love more than the sea, and being able to lounge in the sun as I watched the ocean moved made it one of my most relaxing hours in Japan. Afterwards we travelled towards the Folklore Museum and Namahage-kan. The performance of the Namahage was spectacular, and the experience is something that I would recommend to anyone travelling in the area. The Namahage Exhibit was a well set-out display of many different Namahage - the costumes, though empty, still held an aura of power as they towered over me, their wild and colourful masks judging my every move. Our final stop for the day was on Mt. Kanpuzan, a volcano with stunning views of the Oga coastline. From the top (accessible by a short hike from the car park) I was able to see the world around me, from the golden autumn rice fields to the heady green of the trees, all the way to the crystalline ocean which stretched far into the distance. The Oga peninsula is truly a beautiful place to be. Near unmatched in beauty, I highly recommend the trip to the coast for any person who wants to experience the natural beauty and culture of Akita. Go out of your way to explore, eat something new, and most importantly- have fun!